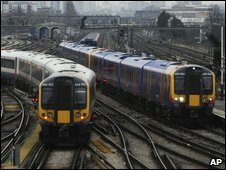 Poor advice from rail staff means some travellers pay more than double the cheapest fare, reports Which? magazine. Enquiries to ticket office staff and the National Rail Enquiries Service (NRES) found prices quoted higher than the lowest fare in 27 out of 50 cases. Two in three station clerks and two in five NRES staff did not offer the cheapest fares and some offered tickets over twice the cost of the cheapest. Train company representatives said the report was "seriously misleading". The consumer advocacy magazine found that two thirds of staff said if a passenger wanted to make the same journey twice in a single week it would be cheaper to buy two returns, when in fact a rover or season ticket would have been the least expensive option. Rail staff also tended not to mention that if the journey was close to the end of a peak period, delaying the time of departure - sometimes by just minutes - could result in savings. And when the magazine checked the efficiency of lost-property services, five out of 16 stations did not contact owners when a coat and wallet were handed in that had been clearly labelled with a name and phone number. Which? magazine editor Martyn Hocking said: "If you just want to know the cheapest way to get from A to B, you'd expect staff at the station ticket office or on the end of the rail helpline to be able to tell you. "It's not acceptable that passengers could be paying well over the odds because of poor advice. "Rail firms must ensure that staff are properly trained and that fare information is clear." However the Association of Train Operating Companies (Atoc) strongly disagreed with the magazine's findings. Atoc's chief executive, Michael Roberts, said: "This report is seriously misleading. "Independent research last year, using a sample of passengers 50 times the size used by Which? and based on the kind of questions most commonly asked by passengers, found that the correct information on rail fares was given 99% of the time. "To help us improve how we handle queries, we have asked Which? to provide us with the actual questions it posed but, for the second time, the magazine has declined to do so." Q&A: What lies behind UK rail fares?